Cruise the French Riviera and sample the beauty and sophistication that have made the Côte d'Azur a favorite destination of sailors around the world. Arguably the jewel of the northern Mediterranean Sea, the Riviera is blessed with one of the most pleasant climates on Earth. From the luxurious comfort of your Moorings Crewed Yacht, watch as the tall peaks of the Alps rise skyward not far from the coast. Nice is a modern town that still embraces its long-standing traditions. You will see them alive and well at the colorful Cours Saleya market - with flowers, fruits and vegetables - and at the lively fish market of Saint-Francois Square. Be sure to stop at the Iles d'Or, the Golden Isles, home to the unspoiled nature preserves of the Ile de Porquerolles and Ile de Port-Cros. Cruise the waters from Monaco to just southwest of Cannes, embracing some of the most exclusive harbors and beautiful bays on the coast. One thing is for certain: Sailing the Côte d'Azur will leave you with a lifetime of memories. Day 1: You've arrived in the exquisite French Riviera! Your journey of luxury and adventure begins at the Nice Marina where you'll meet your Captain and Chef and depart on your short sail to St. Jean Cap Ferrat. Day 2: Another brief sail takes you to Fontvielle Harbor for an opportunity to explore the playground of the rich and famous - Monaco. Day 3: Depart for the historic old town of Antibes and Port Vauban, the largest yachting center on the French Riviera. Walk from the marina to the market, restaurants, bars and interesting shops. 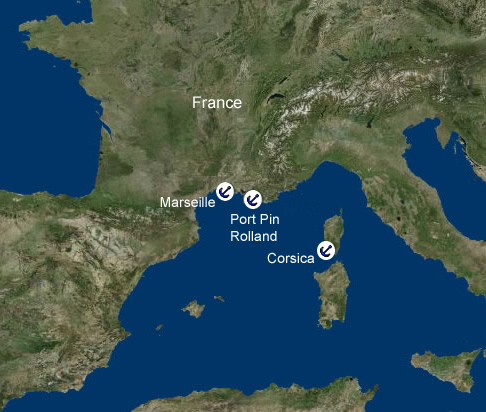 Day 4: Visit Iles de Lerins, a group of four Mediterranean islands near the coast of Cannes. St. Margueite is popular for it's charming restaurants, pubs and walking trails. While St. Honorat's only inhabitants are Cistercian monks who spend their time in prayer and producing wines, honey, lavender oil and Lérina, an herbal liqueur. Day 5: St. Raphael was first popular during Roman times, when wealthy families came to the resort here. Wide beaches, excellent restaurants and coastal ambience abound. Day 6: Enjoy excellent French cuisine at fine restaurants and intimate cafes at the Old Port in Cannes, the site of the world-famous international film festival each May. Day 7: Return to Nice, stroll the Promenade des Anglais along the Baie des Anges "Bay of Angels" and raise a glass to your most memorable vacation ever.